There was a period of time last year when I had trouble falling asleep. I had too many things going on in my life and some of them were very stressful. Without a doubt, this was impacting my sleep. Sometimes I would toss and turn in bed until 2 or 3 AM. Ugh!!! I started looking into how to improve this situation. I made some changes to my routine, such as eating supper earlier, exercising more frequently, and cutting down on sweets before going to bed. I also found soothing and relaxation apps I could download on the iPad to help me relax faster and fall asleep sooner. 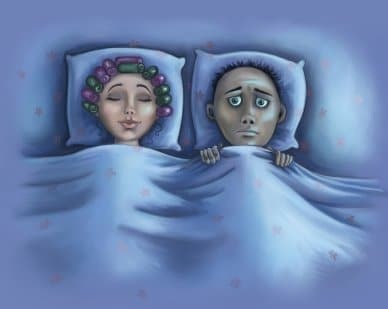 It seems to me a lot of people experience periods of time when stress, daily hassles and life’s challenges affect their ability to fall asleep. Sometimes we can all use a little relaxing escape. So why not use the iPad as a sleep aid? Today I’m going to be discussing 5 different relaxation and sleep Apps for iPad. For all of these Apps there are paid versions that offer more features if you are interested. I will describe for you the “lite” versions only. Need to refresh how to download and install iPad Apps ? 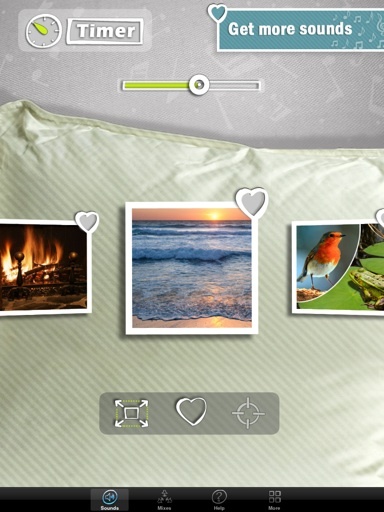 Sleep Pillow lets you choose from a set of 9 relaxing sounds on the free version. You can save sounds to your favorites to re-use later. 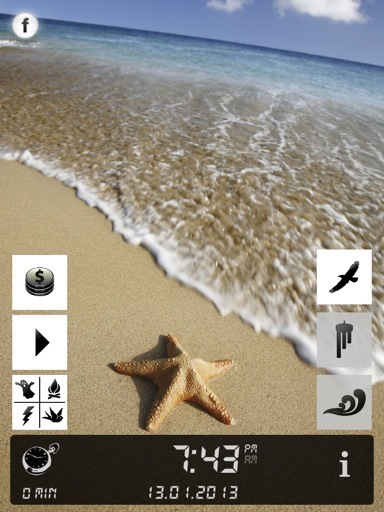 The App lets you create mixes of the existing sounds that can be played as new relaxing sounds. You can also set a Sleep Timer (max 1 hour and 15 minutes on the free version). The paid version (Sleep Pillow Pro) comes with 70 sounds, unlimited sound mixes, sleep timer for up to 12 hours and an alarm clock. 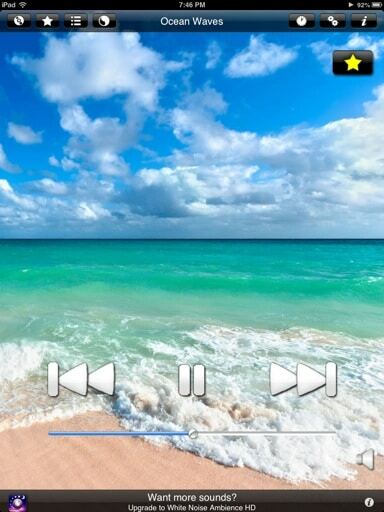 Sleep bug lets you choose from a set of 11 relaxing sounds on the free version. Depending on the sound you can turn on and off some special effects (i.e. birds, wind, violins, drums, guitars, flute, thunder, rain, etc). The App displays date and time on the screen and lets you set up a Sleep Timer. This App lets you select binaural beats (requires headphones), sound effects or music. You can also mix sounds and increase or decrease the proportion of sounds into the mix. The mix of sounds can be saved to your favorites which is very convenient once you’ve identified that relaxing combination! The App comes with an alarm and timer. White noise lets you choose from a set of 12 relaxing sounds. In a similar way to the other Apps, you can create your own sound mixes. You can also populate your playlist, selecting sounds or mixes and the amount of time each should play. The App includes a clock and an audio timer. The sounds on this App have an interesting layout. They are hanging on chords. Each time you select a sound you can adjust its volume. You can mix up to 10 sounds on the free version. The mixes can be saved onto your favorites. The App also includes an alarm and timer. 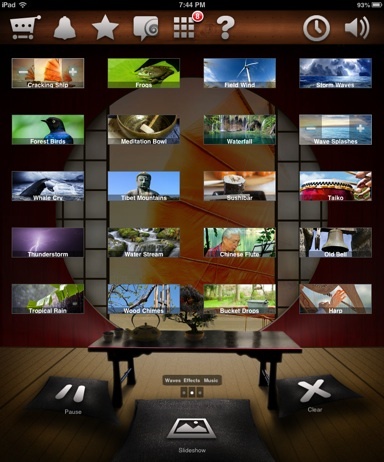 Why not download these free Apps and give them a try? You can play with the sounds and mixes until you find that relaxing combination that puts you to sleep!! When you find it, don’t forget to drop me a line to tell me about it! Happy relaxing and sweet dreams!! !